It was Labour's failure to excite their base which lost them the election. Moving to the right won't help. Labour lost the 2015 election astonishingly badly. It wasn't a particularly convincing win for the Conservatives, who barely scraped an overall majority in parliament with the backing of 24% of the electorate, but it was certainly a very, very convincing loss for Labour. So what happened, and why? In Scotland, once full of supposed safe seats for Labour, they were almost completely wiped out by a resurgent SNP, who opposed them on a platform of standing up for social justice and against austerity and nuclear weapons. In other words, they positioned themselves well to Labour's left, at least rhetorically - arguably their actual policies were only a smidgen less right-wing than Labour's, but they talked like passionate and imaginative social democrats, if not actual socialists, while the Labour party could do nothing to shake off its 'red tories' tag north of the border. They may have earned that name mainly by standing shoulder to shoulder with the official Tories in the independence referendum, but Blair's legacy still looms large, and Miliband's timid efforts to shake it off never amounted to much. So for the first time in decades, a sizeable chunk of Britain had the chance to vote for an electorally viable party positioning itself on the left... and enough of them leapt at the chance that 56 out of 59 Scottish seats fell to the SNP. That's not how many people are interpreting the Scottish result, of course; Miliband blamed it on 'a surge of nationalism', but there has been no rise in nationalist sentiment in Scotland. Yes, the referendum campaign roused and inspired great segments of the population, on both sides of the question, including many who do not engage with electoral politics. But it was dominated by discussion of how we could make the country better by transforming its political economy, by learning important lessons from other countries about social and industrial democracy, by taking seriously alternatives to the British status quo. It was that tide of hopeful envisioning of better futures that carried the SNP through this election, not some mythical tide of nationalism. It wasn't just in Scotland that Labour were roundly defeated, though - they could have held on to every seat here, as Jim Murphy once insisted they would, and it wouldn't have made a jot of difference to the Conservative majority. One popular explanation for this is that they were just too right-wing for Scotland, but too left-wing for England. This seems to be the attitude of most of the contenders for the Labour leadership, who have lamented Labour's inability to get rich right-wingers to vote for them. But surveys on policy questions and attitudes suggest that the differences are marginal between Scotland and England, even though the political culture is noticeably different. If Scotland is really a lot like England in most ways, and it voted strongly for a party well to the left of Labour the first chance it got, another explanation suggests itself. Perhaps Labour lost this election by agreeing with the Tories about almost everything. It may be that trying to entice voters who lean towards Conservative or Ukip was a strategic error, because both of those parties are better at being Tories than Labour will ever be, and doing so lost them the support of huge numbers on the left. This would explain reports that the opinion polls got this election so wrong not because people didn't want to admit they were voting Tory, but because so many vaguely intended to vote Labour but didn't end up making it to the polling station. Almost three million of them, acording to Ipsos MORI. From Ed Balls saying he'd change nothing in George Osborne's budget to Rachel Reeves saying she didn't want Labour to be 'the party to represent those who are out of work'; from their 'Controls on Immigration' mug to their vote in favour of £30bn more cuts, Labour allowed Tories to set the agenda throughout the last parliament. They didn't challenge underlying economic assumptions even when they were manifestly wrong, they did nothing to stem anti-immigrant hysteria or the demonisation of the poor. How much further right could they really move without becoming totally indistinguishable from the official Tory party? The problem is, of course, that many in Labour still think back fondly to 1997 and the thirteen years that followed. Ah! Remember when we used to win elections! Those were the days. Never mind that Blair presided over rising inequality and further privatisations, initiated illegal wars, did nothing to repeal Thatcherite anti-union laws, and succeeded in pushing the country's political climate a long way to the right. Labour won elections! Three of them in a row! Imagine! Many are treating this data point as overwhelming evidence that this is the only way Labour can ever hope to win an election again - by tacking even further to the right, convincing rich capitalists to support them like they did in the good old days of the late 1990s and early 2000s. However, there is another way of looking at the last 20 years of British political history, and Labour miss it at their peril. The first thing to note is the collapse of electoral turnout following Blair's rise to power. Turnout for the 1997 election hit a historical low of 71.4%; that was still high compared to 2001 and 2005, on 59.4% and 61.4% respectively. Where did all those voters go? It's hard to say conclusively, but the top reasons cited by abstainers are that parties are all basically the same, and they don't think their votes will make a difference. So it doesn't require to much of a leap of imagination to suggest that many of them no longer saw much point in voting Labour after Blair pulled the party so far to the right - which, again, would help explain their wipeout in Scotland. Non-voters in a 2013 survey were twice as like to say they would have voted Labour if they had voted at all, compared with Conservatives. 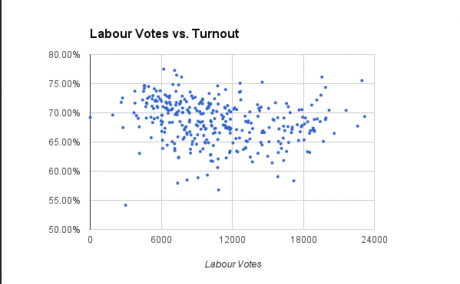 There's a significant correlation between constituencies with low turnouts, and those with large Labour votes. There are 50 seats that Labour could have won from the Tories (enough for the two parties to swap their positions in this parliament) by convincing less than a fifth of non-voters to turn out and vote for them, and that's before we even start on the SNP. Is it absurd to hope to re-engage so many? This would still only take us back up to the average turnouts we saw in elections from the 60s through to the 90s; that's surely not so unrealistic.So when leadership candidates and media pundits insist that Labour's only hope now is to reach out to the 'aspirational', the 'John Lewis shoppers', the rich, with more pro-business policies and a return to Blairism, they are at best blinkered, and at worst disturbingly disingenuous. What the Labour party needs above all is someone willing and able to challenge the Tories - and that means having the courage, and the convictions, to vocally disagree.